Nat Hentoff, American historian, writer, and music critic, once asked Billie Holiday who had most influenced her musically. Her answer was Louis Armstrong. "He didn't say words," she said, "but somehow it just moved me so. It sounded like he was making love to me. That's how I wanted to sing." This coming from one of the most moving singers in American musical history is a testament to Armstrong's music. But lucky for us, Louis did say words, and had a unique and riveting voice that shines alongside his virtuoso trumpet in this jamandahalf. "(What Did I Do To Be So) Black and Blue" is one of the most powerful songs of the 20th century. Although not originally written by Louis himself (written instead by Andy Razaf), Louis makes every word, every syllable, of the song his own. More so, on his two trumpet solos Armstrong charges each beat, each warble, each improvised note with an energy that manages to impress and shock me each time I hear it. Musically, the song is defined by these solos which are both an expression of Armstrong's talent, and a continuation of painful lyrics of the song. 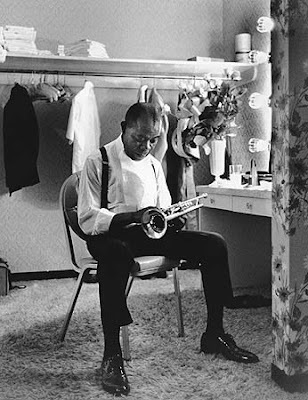 Armstrong's gravely voice is the perfect personification of his trumpet, and the solos are verses in their own right, capable of just as much emotion and story-telling as any written words. which can be interpreted as two ways. One view, as I look at it, is that Armstrong is saying that we are all one, regardless of what we look like. That the Jim Crow era United States limited the rights of people based only on something that we have no control over: our skin color. Another view could see the lines as Armstrong flatly rejecting his ethnicity. While both views can be strengthened by the repeated line in the next two verses: "my only sin/is in my skin," in context with Armstrong's history regarding the Civil Rights movement, the lines seem to hold a greater meaning of our oneness. Placing the song in context, it was released in a especially turbulent time of our history, coming eleven months after the landmark Brown vs Board of Education which desegregated schools. Armstrong later severely criticized President Eisenhower's reluctance to act when African American teenagers were banned from attending high school in Little Rock Arkansas, saying publicly that "The way they are treating people in the South, the government can go to hell," and "The President has no guts." In this light, the message of the song becomes more clear. Rather than a denouncement of his ethnicity, the song becomes a protest song, an attack on American society for seeing people for their color of their skin rather than their character. His only "sin," sings Louis with an understated sarcasm, is that he was born with dark skin. This jamandahalf also holds an important place in the literary masterpiece, The Invisible Man by Ralph Ellison. The book itself is often compared to a jazz song with its various movements, its improvisation, and how it, like jazz, takes an often depressing story and makes it art. In the prologue, the unnamed narrator alludes to this very jam, and it appears two more times throughout the story. Both the song and the novel look at the juxtaposition between how an individual sees himself compared to how they are seen by society, and in some ways, the novel could be seen as a lengthy elaboration of this song, but thematically and artistically. The weight of this jam, its unique place as one of the first popular songs to look at race relations in the US, its connection to one of the greatest novels of all time, and the sublime trumpet playing and singing of Louis Armstrong have me convinced that this is one of the greatest songs of the 20th century. Let me know what you think in our new comments system.